Greetings fellow human beings, Professor Magic Xylophone here, expert in all things science. The Rosses have called on my extraordinary brain once again to protect you innocent movie-goers from evil movie producers and their pseudo-science. This week they also claim clairvoyance! Well I claim shennanigans! Let the science begin! I’ve always been intrigued by the idea of epic disaster movies. If governments were forced to choose only a handful of people to save and rebuild society, then surely a genius like me would be first in line. I would then have to mate so that my genes were added to the collective, and Holy Heisenberg!, I’d get to have as much coitus as a Vulcan on Pon Farr. Unfortunately for me (but maybe not for you Chads, Brads and Don Juans) the world will not end in the fashion laid out in 2012. 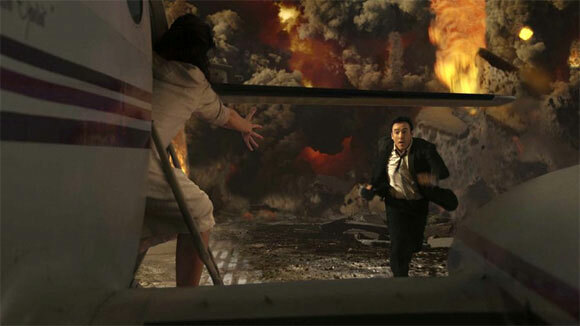 First, the premise of the movie: Neutrinos from solar flares have heated the Earth’s core up to extreme temperatures, causing the crust to shift and the apocalypse to occur. For those of you who don’t know what neutrinos are, they are tiny elementary particles that have practically no mass and no electronic charge and can travel through mass almost undisturbed. Though elevated neutrino levels may be useful in detecting the presence of a cloaked Romulan ship, they couldn’t heat up my cup of soy milk in a million years! This is phoney science! Quick, get out of here! Michael Bay is filming a romantic drama! Now let’s just throw 2012 a proverbial bone here and say some sort of ridiculous mutation (or whatever they suggest in the movie) causes neutrinos to heat up matter. It is estimated that more than 50 trillion neutrinos emitted from the sun pass through the human body every second. Why aren’t we being heated up and popping like the bags of mostly water that we are? Scientists in the movie are measuring the temperature of the extinct volcano at Yellowstone National Park, because they suspect it is about to blow. One ‘scientist’ claims the temperature is 27,000°C at 14,000 feet depth. The surface of the sun is only approximately 5,510°C, did they even bother to check how hot that is??? That’s just lazy! Speaking of temperatures, do you remember when a dust cloud overtakes the plane flying away from the exploding volcano at Yellowstone? That dust cloud is known as a pyroclastic flow and they have temperatures of around 1,000°C – the plane should have been incinerated along with our heroes. So what about the Earth’s crust shifting around so that Wisconsin is the new South Pole? Nonsense! The Earth’s continents can’t shift around more than about a degree every million years, no matter how hot the core is. All this is meant to coincide with the end of the Mayan calendar in 2012 BTW (hence the clever title of the movie) – however the Mayan calendar no more ends in 2012 than my Gregorian one ends on December 31st: they just start a new cycle! There are so many flaws in this movie that I could write all day. It’s really just another journeyman in the sea of disaster movies, your time would be better spent reading the latest issue of Astronomy & Space Magazine, but just to summarise: Tsunamis barely affect ships at sea; an Antonov 225 cannot perform aerobatic manoeuvres like a Red Arrow (there is no such plane as an Antonov 500 as written on the side of the plane BTW) and it can’t take off on a runway as long as a football field (fully loaded harriers can barely do that); children’s chronic bedwetting problems don’t just go away and, unless we’re in some temporal distortion or near a black hole, time proceeds at a normal rate (not however long it takes our heroes to get to safety). I believe my work here is done. May the cosmic ballet… go on! This entry was posted on November 30, 2009 at 10:16 am and is filed under MAGIC XYLOPHONE with tags 2012, Movies, plot holes, Roland Emmerich, Science. You can follow any responses to this entry through the RSS 2.0 feed. You can leave a response, or trackback from your own site. I have’nt seen this movie yet but I don’t think I’ll ever watch it now, as somebody who studied Geophysics(although not very well) this film insults my intelligence, plates suddenly shifting to the other side of the planet? neutrinos heating up the earths core? what nonsense!!! next you’ll be telling me theres a black president in it, as if that would happen!! We don’t pay you for your opinions… Misterrrr Scientist! in fact, we don’t pay you at all.